Bog Meadow Trail reopened on November 3, 2018. 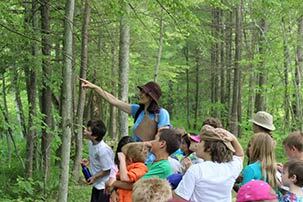 The Bog Meadow Brook Nature Trail, located in Saratoga Springs, was one of Saratoga PLAN’s earliest accomplishments. This two-mile path, great for warm season walks and cold season skiing, is a favorite among nature lovers. The trail was developed in 1993 by the Saratoga Springs Open Space Project (now Saratoga PLAN) in cooperation with the City of Saratoga Springs. The path travels along an abandoned railroad that once connected the city to various locations throughout the Northeast. 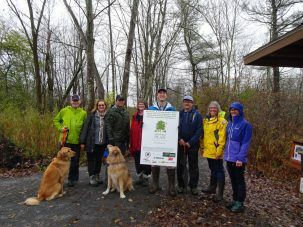 The Meadowbrook Preserve, which encompasses 174 acres of wetlands and woods, surrounds the trail, working to protect the watershed where maple, ferns, meadowsweet, and evergreens are commonly found. The majority of the Meadowbrook Preserve was donated to the Saratoga Land Conservancy (now Saratoga PLAN) back in 1988 by the Anderson family, with an additional parcel donated to PLAN in 2006 by Belmonte Builders and Bonacio Construction. 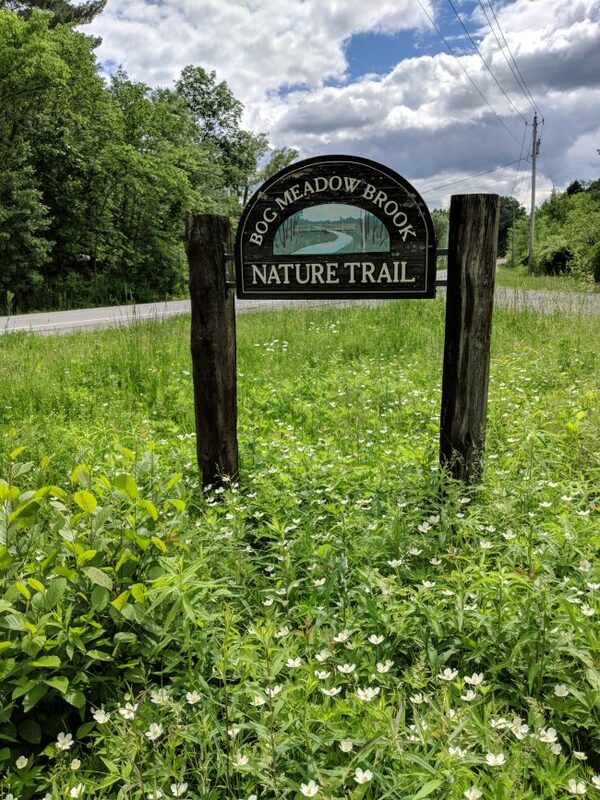 The entire Meadowbrook Preserve is owned and maintained by Saratoga PLAN, and the Bog Meadow Brook Nature Trail is owned by the City of Saratoga Springs and maintained by Saratoga PLAN. The Bog Meadow Brook Nature Trail is two miles long with designated parking areas on each end. From downtown Saratoga Springs: Take Lake Avenue/Route 29 east from the city. Go through the traffic light at Weibel Avenue. The trail entrance will be about 300 yards past the light on your right. From I-87: Take exit 14 and head west on Union Avenue, towards Saratoga Springs. At the first traffic light make a right onto Henning Road. At the intersection/light with Lake Avenue/Route 29, make a right. Go through the traffic light at Weibel Avenue. The trail will be about 300 yards past the light on your right. From downtown Saratoga Springs, follow the directions above, then proceed east on Route 29/Lake Avenue past the Route 29 entrance. At the first traffic light, make a right onto Staffords Bridge Road then take your first right onto Meadowbrook Road. The parking lot will be 1/4 mile down the road on your right. From I-87: Take exit 14 and head east on Union Avenue (toward Saratoga Lake). The first intersection will be Gilbert Road on your left, immediately followed by an intersection with Meadowbrook Road on the left. Take Meadowbrook Road for about 2.2 miles to the new Bog Meadow trailhead on your left. The new trailhead begins in the parking area. This entrance was reopened in early November 2018. Saratoga PLAN has gone through quite a bit of growth over the years. In 2003 two conservation organizations, the Saratoga Springs Open Space Project, and the Saratoga Land Conservancy, merged together forming Saratoga PLAN.